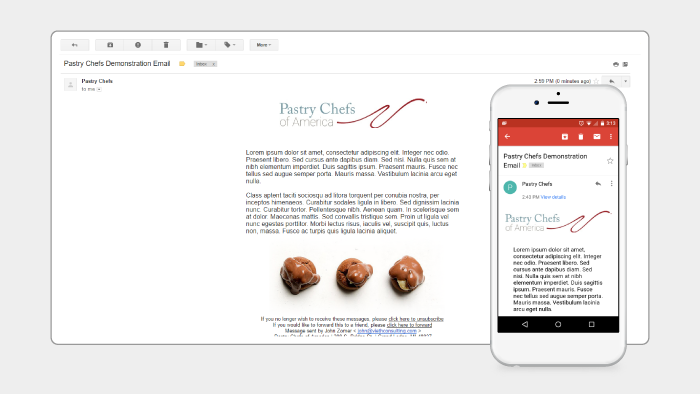 You can easily communicate with your members, prospects, and subgroups easily by sending out mobile-friendly broadcast emails or newsletters. Advanced Editor - utilizing a sophisticated drag-n-drop interface, admins can create complex and professional looking emails and newsletters. Mobile-Friendly Templates - the editor works by first setting up 'templates' for the publication you want to create. The template allows to you set up the common attributes for the publication such as the header image, masthead, number of columns, colors, footer, and more personalized to your organization, including setting up various templates to use for different types of communications you send out. 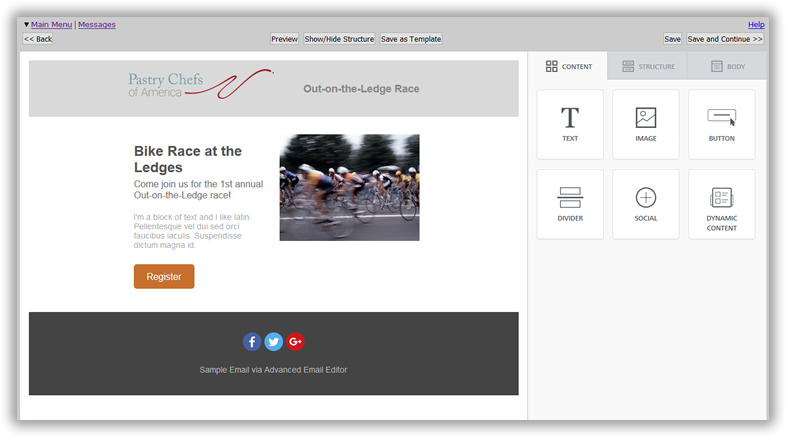 Once a template is created (frequently we work with you to set up the initial template), you can add a newsletter (issue) and add/edit articles within the newsletter, and then use the included tools to email using our broadcast email message module. Messages Built for all Email Clients - different email clients (Outlook, Gmail, etc.) will display emails in different ways. By using our advanced editor's mobile-friendly templates, you can be sure that your message will be readable in all clients. Mobile/Desktop Preview - view how your message will look in a desktop client versus a mobile phone. Attachments - attach images, PDFs, flyers, etc. to your emails. Posting Date - you can schedule your newsletter to be posted to your website on a specified date. Community Posts - you can also allow members and non-members to submit articles for an admin to approve for inclusion in the Newsletter. Spam Analysis - get a score on how 'spammy' your email may look to various spam filters. With this info you can adjust verbiage to avoid the spam-folder and maximize deliverability. Open-rate Statistics - see who opened up your emails and on what specific dates. Click-thru Tracking - see who clicked through on which links in your emails. Bounce Tracking - the system tracks rejected/bounced email addresses and includes a system that allows you to easily update/correct the invalid emails. Recipient List Builder - when sending a message, you have a large variety of tools allowing you to select recipients - by member type, by committee, by join date, by custom fields, and more! Query-based Recipients List - you can also build queries on the member database, that can later be used to add recipients. Very useful for highly targeted lists. Member Submission Control - members can submit messages to be sent to the rest of the membership, but these are pended for admin approval. Join/Renewal Reminders Embedded - optionally include links at the top of messages - prospects can receive a link to join and members (if owing dues) can receive a link to pay dues. Opt-out - recipients can opt-out from your lists automatically, or they can send a manual message to an 'email manager'; this allows you to personally attend to removal requests, so members don't unintentionally opt-out when they just might want to reduce the number of messages they receive. Scheduled Messages - if you know you want to send a reminder message in the future concerning an upcoming event, you can schedule it now for a later date.